Some new realtors are astounded to discover how many people hate real estate agents. We're not talking about a slight dislike. This hatred is a big-time fury. With some people, their disdain for realtors is a truly deep-rooted hatred, engrained in their souls and passed down to their children's children. Unfortunately, some of that hatred is justified. It's the bad apples in the barrel that give every other real estate agent a bad name, but there is more to it than that. For starters, it is the fact that just about anybody can become a real estate agent. Until a few years ago in California anybody could get a real estate license just by passing the exam. A person did not have to graduate high school to obtain a real estate license. Today, the state of California requires minimum educational requirements, but it's still not enough to suit most of us. Sizing up an agent is difficult for many people because so many agents fluff and puff about themselves. It's hard to tell what is true and what is misrepresentation or an outright lie. Most agents are honest, however, and ethical. A fair assessment is about 3 out of every 4 agents don't have enough experience and will probably never gain enough experience to develop themselves into the professionals they should become. There is no school like the school of hard knocks, and most agents learn on the job. The realtor associations offer webinars and seminars for agents, but still, the information has to be retained by the agent and delivered by a credible source to be viable. Seminar speakers are not required to be licensed to deliver seminars, although some are able to obtain credentials to offer continuing education credits to agents. There is a huge turnover in the real estate industry. Industry statistics show the number of active real estate agents falls and rises with the economy. When times are good and consumers are optimistic, the number of active real estate agents rises, so even though a large number might not renew their licenses, a fresh batch of newly licensed agents fills that void. The 2007 mortgage meltdown sent many agents running for the hills. Where Do Real Estate Agents Come From? The majority of real estate agents come from other walks of life, other professions. Few start out fresh from college desiring to become a real estate agent. It's generally an industry they later fall into because, quite frankly, the other options available to a professional of a certain age can be very limited. They are former grade school teachers, dental hygienists, hairdressers, police officers, nurses, taxi drivers, scientists, lawyers, photographers, small business owners, personal assistants, receptionists, newspaper reporters, and more. Skilled and unskilled. Educated and uneducated. Many are misfits. People who don't fit into any other kind of profession. People who buck tradition and are rebels. People who mistrust authority. Real estate is a business in which the newly minted real estate agent is placed on the same level as an agent with 20 years or more of experience. Generally, experienced agents who close at least one transaction a month and continue to produce for 20 years will have closed, theoretically, more than 240 sales. From those sales, agents make mistakes, hopefully, learn from those mistakes, and thus possess the ability to protect their clients from suffering through the same mistakes. There is value in experience. 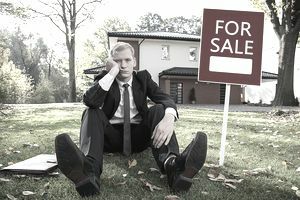 To sell a home, some people think it means just stick a sign in the yard and post photographs online. Those two actions might attract a buyer but they don't necessarily sell a home. A lot can happen between signing the contract and closing. A smart agent knows how to negotiate and how to handle problems that can pop up such as appraisal issues, home inspection repairs, buyer's lender requirements, buying and selling concurrently, contingency releases and more. If the solution to every problem is for the seller to throw money at it, and the seller is willing, then you might not need an agent, but that is rarely the answer all parties seek. The truth is some agents don't earn what they make. But many other agents do. And it's the money that can originate from one transaction that sometimes sends outsiders into a tailspin. They think it's too much. But they don't see the fact that most agents do not sell more than 4 homes a year. From that income, their broker takes a cut. The agents then pay taxes and overhead. The leftover amount, the net profit, is not as much as it may appear. Often, how much an agent makes is a source of irritation for those who earn less, regardless of status or education. It's not fair, but it's the way it is.